In the first part of this series, guest contributor Cody Cook argued from Psalm 82’s condemnation of the divine council that both fallen angels and unsaved human beings will be finally punished with death, rather than with immortal life in everlasting torment. “The ultimate fate of these rebellious angels,” Cook writes, “is capital punishment—death. . . . Though these beings are divine in a general sense, and therefore not susceptible to the fragilities of human experience, they will nevertheless die just like human beings do.”1Cook, C., “Conditional Immortality and Angels, Part 1—The Mortality of Angels and Men (Psalm 82).” http://www.rethinkinghell.com/2018/01/conditionalism-and-angels-part-1-mortality-of-angels-and-men-psalm-82/ But while Cook contends for the mortality of fallen angels and men from Psalm 82, others occasionally argue for their immortality from another passage, one not often cited in the debate over the purpose, nature, and duration of hell. So, angels and demons are immortal, and all resurrected human beings will be made likewise immortal, and all by itself this disproves conditionalism. What’s more, although not noted by my opponent, while some conditionalists believe that Satan and the demons will suffer forever, others such as I believe Scripture teaches that these beings will share the same fate as the risen wicked: annihilation. Traditionalists might therefore point to this passage as evidence that the eternal punishment awaiting Satan and the demons is an eternity of torment, since they cannot die, further challenging conditionalism. It’s worth first noting that this argument rarely, if ever, comes up in the scholarly literature purporting to refute conditionalism. One won’t find it it in Morey’s Death and the Afterlife, Peterson’s Hell on Trial, Blanchard’s Whatever Happened to Hell, Dixon’s The Other Side of the Good News, Reymond’s Contending for the Faith (containing a chapter responding to John Stott on hell), Boa’s and Bowman’s Sense & Nonsense About Heaven & Hell, or in any author’s contribution to Hell Under Fire.3That is unless the Scripture indexes in these books are incomplete. I’m aware of no noteworthy, scholarly defense of the traditional view of hell which makes an argument similar to this one. It seemed strange to me, then, that my opponent should claim that this text, ipso facto—in and of itself—refutes conditionalism. Had he really stumbled upon ironclad, irrefutable evidence unnoticed by myriad traditionalist scholars vastly more learned, more studied, and more intelligent than either of us? While possible, I suspect it is far more plausible that he simply overstated the weight of the evidence, and that traditionalist authors don’t use the argument because it holds no water. Indeed, a closer look at the text demonstrates that that’s the case. First, recall my opponent’s words: “Christ tells the Sadducees that in the resurrection men and women will be raised from the dead and they will be like angels . . . if angels don’t die . . . then neither the righteous nor the wicked will cease to exist bodily” (emphasis added). My opponent’s concluding words reveal an unstated assumption: that Christ says both the saved and the unsaved will be made like the angels. Yet, it is abundantly clear that Jesus has only the saved in mind. In Luke 20:35, Jesus says those who do not marry and do not die are “those who are considered worthy to attain to that age and the resurrection from the dead.” In verse 36 he calls them “sons of God.” It is doubtful that my opponent thinks those who die apart from Christ will be “considered worthy” to be called “sons of God.” And in verse 37, as well as its parallels in Mark 12:26 and Matthew 22:32, Christ offers as proof of the resurrection that Moses calls Yahweh the God of Israel’s patriarchs with whom the saved will recline at the table on the day of the great wedding feast (Matt 8:11). Since Jesus clearly limits his statement to the saved, the most one can conclude from this passage with respect to resurrected human beings is that the saved will rise and never die. The text indicates nothing concerning the fate of the risen wicked. this verse is usually brought up not by traditionalists, but by members of the various “Church of God” groups, most or all of whom believe in the annihilation of unsaved humans. It is among the proofs used by Herbert W. Armstrong, the founder of the original Worldwide Church of God, to show that the devil is immortal . . .4Dear, J. The Bible Teaches Annihilationism. Unpublished. 293. But such “partial annihilationists,” as they might be called, and traditionalists who might argue similarly, make a mistake similar to the one made by my debate opponent. Whereas he mistakenly assumed that Jesus says all resurrected human beings would be made like the angels, those who make this argument mistakenly assume that Christ says it is all angels whom the risen elect will be made like. Again, this assumption is is demonstrably mistaken. In both parallels to Luke’s record, Jesus clearly limits his statement about angels to holy ones. Mark and Matthew record Christ saying the saved will be “like angels in heaven” (Matt 22:30; Mark 12:25). What’s more, out of nearly two hundred uses of the word translated “angel” in the New Testament, the vast majority refer unmistakably to God’s angels, and the six which clearly refer to demons (Matt 25:41; 2 Cor 12:7; 2 Pet 2:4; Jude 6; Rev 12:7, 9) do so by describing them as Satan’s angels, or as angels who sinned. Without such a qualifier, the word angel, when used of supernatural beings (and not human messengers), refers to God’s angels. 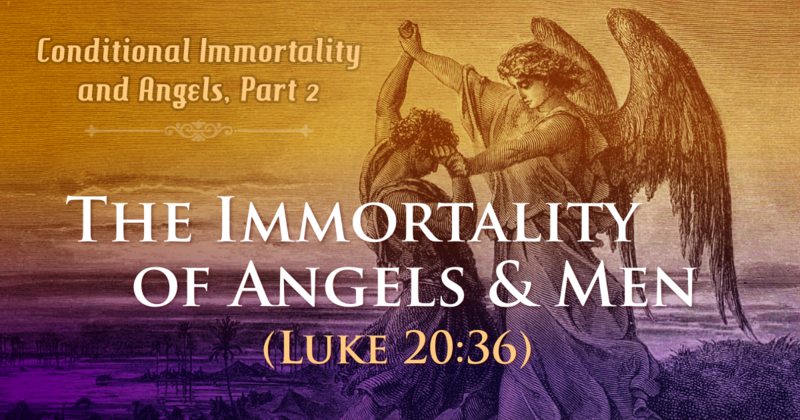 Additional reasons exist for believing that Jesus is not including demons when he calls angels immortal.5Dear, 293-296. But even in the extremely unlikely event that Jesus is including them, it still does not challenge the belief that Satan and his demons will be annihilated along with the unsaved. As traditionalists often acknowledge, only God is inherently or intrinsically immortal, the Greek word translated “immortality” literally meaning “not dying.” And if any creature is immortal and will not die, it is only because God wills it to be so. As Paul reminds Timothy, God “alone has immortality” (1 Tim 6:16). Commenting on this passage, George Knight writes, “‘immortality’ is intrinsically unique to God (cf. Ps. 36:9; Dn. 4:34; Jn. 5:26).”6George W. Knight III, The Pastoral Epistles, New International Greek Testament Commentary (Eerdmans; Paternoster, 1992), 270; emphasis added. Charles Ellicott, cited approvingly by William Mounce, concurs: God is “He in whom immortality essentially exists, and who enjoys it neither derivatively nor by participation.”7Charles J. Ellicott, The Pastoral Epistles of St. Paul: Critical and Grammatical Commentary, 4th ed. (Longmans, Green, Reader, & Dyer, 1869), 99; emphasis added. Cited by William D. Mounce, Pastoral Epistles, Word Biblical Commentary (Thomas Nelson, 2000), 361–2. Consistent with this text and the aforementioned commentators, Alan Gomes says, “The soul, as a created substance, depends on God’s continuing providential support—just as all other created entities do.”8Alan Gomes, “Evangelicals and the Annihilation of Hell.” Christian Research Journal (Spring, 1991). 14. Robert Morey likewise writes, “only God has essential immortality as an attribute of His being. . . . man is always and absolutely dependent upon the Creator for this life as well as for the next life” (which must, according to Morey, be logically be true of angels as well, given his statement that only God is essentially immortal).9Robert Morey, Death and the Afterlife (Bethany House, 1984). 94. If any undying creature’s immortality is derived from God, by his will, then he is capable of destroying it, should he will that it no longer be immortal. And so, when Jesus says of resurrected human beings that “they cannot even die anymore, because they are like angels,” he is talking only about saved human beings, and only about godly angels, the angels of heaven. Besides, only God is intrinsically immortal, and God can destroy immortal angels, who derive their immortality from him, if he so wishes. It makes sense that God would grant everlasting immortality only to those angels who obey him, and only to those humans who, having placed their faith in his Son, “shall not perish, but have eternal life” (John 3:16). My opponent’s argument, then, is an argument best avoided—which is, perhaps, why traditionalist scholars so consistently avoid it. Alternatively, perhaps traditionalist scholars avoid this text because it is, in fact, support for conditional immortality. After all, if it is only the angels in heaven and believers in Christ who are given immortality and cannot die, then it follows that demons and unbelievers will not be immortal and will die, which is consistent with the repeated testimony of the rest of Scripture—including Psalm 82’s promise that fallen angelic beings will die as fallen human beings do. Or perhaps conditionalists—those who believe Satan and the demons will be annihilated, that is—haven’t often pressed Luke 20:36 into service, leaving traditionalist scholars unaware that the text is relevant to the debate in the first place. Whatever the reasons why traditionalist literati are silent concerning this text, traditionalist laity has suffered from their silence, and as a result this bad argument against conditionalism (which ends up working in conditionalism’s favor) occasionally surfaces in popular conversation. When one identifies an obvious hole in the case against one’s own position, it is very human to dismiss the rest of that case, even if only subconsciously. When conditionalists improperly leverage Ezekiel 18:4 in a defense of annihilationism, traditionalist critics may fail to truly consider the rest of the arguments presented, as sound as they may be. But the reverse is true as well, and when traditionalists attempt to challenge the doctrine of conditional immortality by pointing to Luke 20:36, for better or for worse they cast the rest of their case in doubt. Scholarship on both sides of the debate, therefore, ought to endeavor to educate the less informed who otherwise affirm their respective view of hell. 3. ￪ That is unless the Scripture indexes in these books are incomplete. 4. ￪ Dear, J. The Bible Teaches Annihilationism. Unpublished. 293. 6. ￪ George W. Knight III, The Pastoral Epistles, New International Greek Testament Commentary (Eerdmans; Paternoster, 1992), 270; emphasis added. 7. ￪ Charles J. Ellicott, The Pastoral Epistles of St. Paul: Critical and Grammatical Commentary, 4th ed. (Longmans, Green, Reader, & Dyer, 1869), 99; emphasis added. Cited by William D. Mounce, Pastoral Epistles, Word Biblical Commentary (Thomas Nelson, 2000), 361–2. 8. 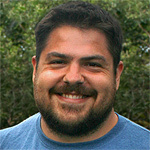 ￪ Alan Gomes, “Evangelicals and the Annihilation of Hell.” Christian Research Journal (Spring, 1991). 14. 9. ￪ Robert Morey, Death and the Afterlife (Bethany House, 1984). 94.